Image 2: LOLA (Lunar Orbiter Laser Altimeter) gridded DEM (240 m/pixel) over Clementine UVVIS 750 nm mosaic showing the topography of the lunar south polar area. The black box surrounds the Schrödinger impact basin, which is the location of Image 3, and the white dashed line is the approximate location of the rim of South Pole-Aitken (SPA) impact basin. 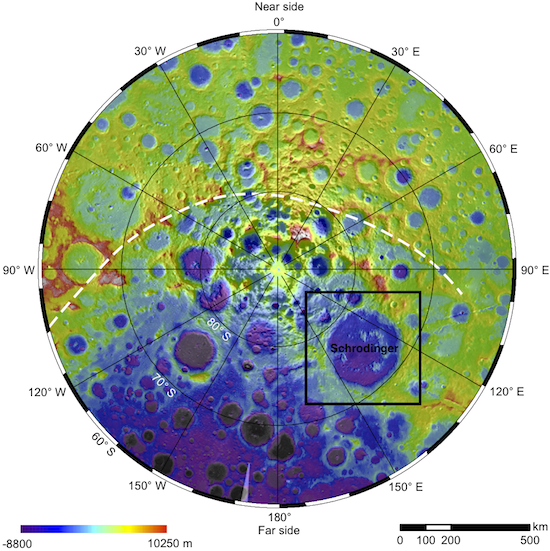 Unlike much of the lunar nearside, the south polar region of the Moon shows little evidence for volcanic activity. The largest concentration of mare deposits in this area are found along the eastern limb (near 90°E), and several impact crates and basins, such as Schrödinger basin, contain mare deposits on their floors. Image 3: Part of the Clementine UVVIS 750 nm global mosaic showing a close-up view of Schrödinger basin (~314 km in diameter). The location of Image 1 is shown (black box). The floor of Schrödinger consists primarily of plains materials that display a variety of surface textures and albedos. These materials have been interpreted to be impact-related materials (e.g., Schrödinger impact melt, ejecta deposits from nearby craters), mare deposits, or pyroclastic deposits (dark feature left of center). 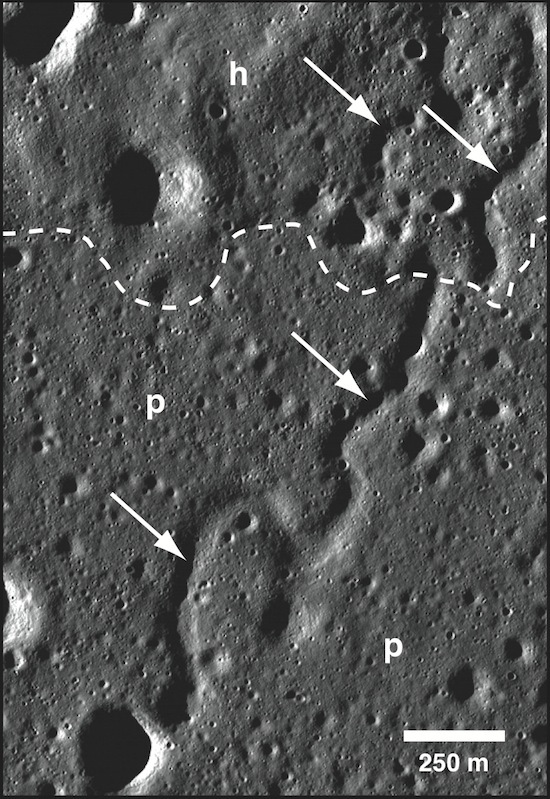 Recent geologic mapping using high resolution images from the Lunar Reconnaissance Orbiter Camera (LROC) has been able to constrain the spatial extents of the deposits on Schrödinger’s floor, as well as identify previously unseen features that can be used to constrain the origins of these deposits. Image 1 shows a previously unobserved sinuous rille that cuts across part of the floor in central Schrödinger. 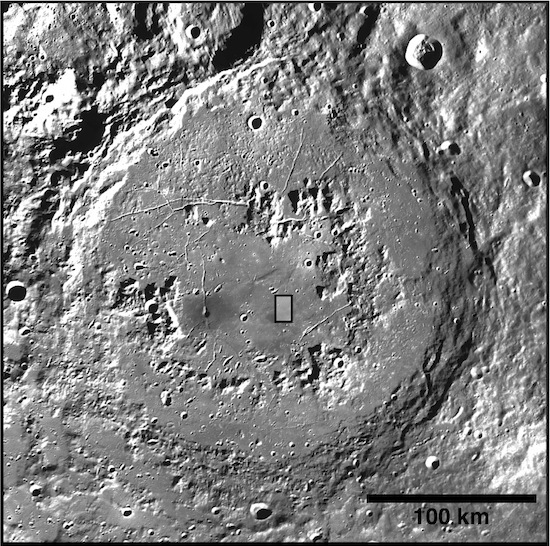 Image data from previous missions (e.g., Lunar Orbiter, Clementine) are lower in resolution than images from the LROC narrow-angle camera and small features such as this rille remained undetected. This rille is approximately 30 km long and extends beyond the boundaries of this image. The rille cuts through dark plains material, that is interpreted to be basaltic in composition, as well as adjacent hilly terrain that may be volcanic in nature (likely basalt) or impact melt from the Schrödinger impact event. The presence of this rille provides evidence that at least some of the materials on the floor of Schrödinger basin is volcanic in nature. Rigorous analysis of additional high-resolution LROC images will enable more previously unobserved features to be discovered.